The Billing section is designed to assist in the setup and daily activities of staff/employees who use the Integrated Billing solution. Note: This this section is not intended for those using the legacy CQI integration. Before getting started with Integrated Billing please review Things you will need to verify with your Accountant , a list of commonly asked questions that your accountant should answer. Initial Billing Setup View this video to learn how to setup your Chart of Accounts, Fee items, and Sales Tax. Setup custom customer messages, payment terms, payment methods, and set system-wide defaults. (NOTE: this training is not intended for those using the legacy CQI integration) Length: ~15 minutes. Imported Data: If you are new to this application's Billing module, information may have been imported from your previous billing solution. If so, you may want to check your beginning balances, chart of accounts and other pertinent information for each member to ensure that your data is correct. No Imported Data: If no billing information has been imported, each member will have a starting balance of $0 and will begin when you create your first transaction. Your first step should be to create the chart of accounts. All Users: Setup Membership Fees, Payment Terms, Payment Methods, Customer Messages, and Sales Tax options. The Billing Options & Settings allow you to establish defaults for such things as number of days ahead of renewal month you wish the task list to notify you that invoices need to be created, default invoice & statement templates you wish to use, credit card processing/manual e-payment settings, etc. Default member record where non-member invoices/receipts will be assigned for purchases: Select the member record to which invoices for non-members will be attached. # of months to look ahead for task list invoice count: Enter the number of months in advance that you prepare your membership renewal invoices. This setting will then trigger the task list to display the invoices pending for that period. Sales Tax Rate: Select the default sales tax rate to be used. Payment Deposit Account: Select the default deposit account to be used when receiving payments or processing sales receipts. Bank Deposit Account: Select the default deposit account to be used when depositing funds. Quick Books On-line: If you are using QuickBooks on-line, click on the QuickBooks Online Connection button. Enter your QuickBooks online login information and say yes to the connections. that is used for event invoicing. This way, any auto-generated invoices will report to the proper A/R Account. You may edit (or add new accounts) by clicking the Edit Account button. Payment Terms: Select the payment terms that you wish to use by default. You will be able to over-ride these terms as needed when creating an invoice, best practice is to select the terms that you use the most frequently. You can add or edit terms by clicking the Edit Payment Terms button. Customer Message: Select or create a customer message that will be included on your invoices by default. When you are creating invoices, you will be able to select the message you wish to apply from a drop-down list. Delivery Method: Select your preferred delivery method for invoices. You will have the ability to over-ride this option when delivering invoices. Best practice is to select the method that you use the majority of the time. 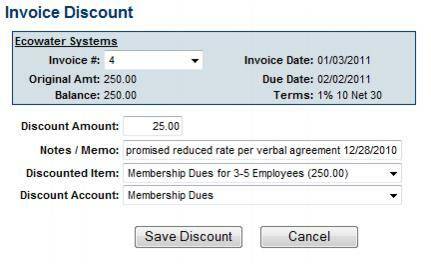 Display the Invoice Discount Memo as the line item description for Invoice Discounts on member Bill Pay screens and invoices/statements: If this setting is enabled, the Memo field (your custom message) will be displayed to members when they view a Discount line item on their invoices, statements, on their Bill Pay screen or in their Transaction History. When this setting is off, Discount line items will display the word "Discount" in member-facing locations. NOTE: The Memo field is available when creating/editing an Invoice Discount. 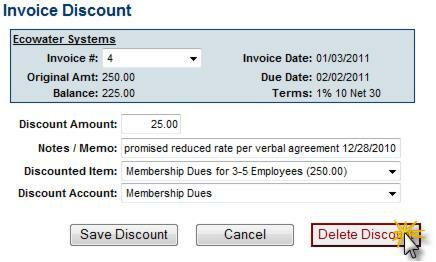 For instance, when editing an Invoice that has a remaining balance, click Add a Discount. The next window has a Memo field where you can make comments or notes about the purpose and reason for a discount. Default Template: Select the template you want the system to use by default. You will have the ability to override the template when creating invoices as needed. Best practice is to select the template that you use most frequently. Email Cover Letter: Create or edit the email cover letter that you wish to use, by default, in delivering your invoices (email). You will have the ability to override the cover letter when delivering invoices. Best Practice is to select the cover letter that you use the most frequently. Allow members and reps to make payments with a Credit Card through their Member Login account: Select this option to allow your reps to make payments on open invoices or make additional payments from their MIC. Add link to bottom of email to pay bills online" selected by default when emailing invoices: Select this option to make it easy for your members to access their bills and pay on-line. NOTE: The rep to whom the invoice is sent must have a login to the MIC, and must have permissions set to read write for on-line bill payment. Send an automatic notification email to the Chamber: Enter the name of the staff person that should receive an email message when a credit card payment is made on line. At this time only one email address can be selected. Select the credit cards that you will accept: Visa, MasterCard, American Express, Discover. Add Credit Card Billing Address as required field: Enable this check-box if you require billing address for credit card transactions. Add Credit Card Security Code as required field: Enable this check-box to require the credit card security code. Automatically create a paid invoice for credit card payments: Select this option if you want an invoice created for each credit card transaction. If selected, you will have both an invoice and a payment record for the sale. Automatically create a receipt for credit card payments: Select this options if you want only a receipt to be created for each credit card transaction. Display Terms and Conditions agreement in checkout cart: If selected, your terms & agreements will appear in all locations where the new checkout cart is in place which includes member payments from the Member Information Center, purchases of jobs and deals and the updated beta event registration. Merchant or Store Name [Optional]: If you choose to enter this information, it will be used to generate an additional message on Credit Card Purchase Receipts that will read: Important: This charge will appear as [Your Merchant or Store Name] on your Credit Card statement. To edit an existing invoice template, the Template Manager must be available in your database. If the Template Manager has been enabled in your database, you will see the selection Template Manager under the Setup module. If the Template Manager is not enabled in your database, contact customer support to receive instruction about enabling this feature. Click Template Manager in the Billing section. Select the template you wish to view/edit, from the Loaded Template drop-down list. Type any desired static text in the desired location in the Page Layout area of your template. All the standard word processing functions are available, such as bold, italics, and so on. Insert database fields clicking Add Database Field. Open the Billing Template Fields, scroll to and click the desired field. Click Save As (so not to modify the original in case you need to return to the old template). Note: The database field titled [invoice_compact_lineitems] generates a unique output when used and is not commonly included on templates except in rare occasions. This database field will take all individual line items billed to the customer and compact them into a single item on the invoice that is displayed to the customer. The line item total will include the total of all individual line items. The line item description for the first item on the invoice is the only item that will display to the customer. In your software, you will still see all individual line items but the customer is kept from getting bogged down with all the items that make up that single item that you’d like to bill them. Click Billing Options and Settings. Select the desired template from the Invoice Default Template drop-down list. Note: There is also a default Statement template that may be selected here. Click Chart of Accounts in the "Billing" area. The current Chart of Accounts will display. Select the Account Type from the drop-down list. The account type should be the account type defined by your accounting software. (Optional) Select an Account Code from the drop-down list. Account Codes are used when deferring income. If necessary, click the add/edit button to add or edit your account codes. Select the Account Status from the drop-down list. Only Active accounts will be available for selection when setting up fee items. (Optional) Enter a description of the account. This is informational only. Click the title of the Account you wish to remove in the Account Name column. Select Inactive from the Account Status drop-down list. NOTE: Best practice is to inactivate accounts as opposed to deleting. Click the title of the Account you wish to modify in the Account Name column. You may designate an account from your chart of accounts to hold undeposited payments and sales receipts. You may also choose the default placeholder account Undeposited Funds instead of choosing a specific account. QuickBooks users should leave this set to Undeposited Funds. Click Chart of Accounts in the "Billing" area. Select the appropriate Undeposited Payment Account. Click Fee Items List in the Billing section. The current list of Fee Items display under the List Options filter. Select the Regular Fee radio button. Account: Select the desired account from your list of Chart of Accounts. Sales Tax: Select whether this item should be taxed or not; if proper tax amounts are not displayed, modify this item by selecting Sales Tax from the Setup module. Price: Type the desired fee item amount – the annual amount or one-time price. Group Fees – available in the Groups module for billing an entire group a single price all at once. Non-Dues Fees - used for tracking other fees that don't fit into a type above. Status: Select Active or Inactive (only Active items may be billed). Fee Items, when set to inactive, will present options to either remove the fee from the member or remain on the member account. Inactive fees on a member account will not be billed. Frequency: Select desired default frequency (available only if Member Fees and Dues item type is selected). Annual, Semi-annual, Quarterly, Monthly, One-Time. This selection may be changed on each members’ account as desired. Voluntary: If desired, click “Treat this fee as voluntary”. (Not available when creating a Bundled Fee.) Note: Unpaid voluntary fees do not count against a member's account balance and are not automatically included on billing statements. Batch Group: If you would like to batch this fee item separately from other batches when creating invoices, select a group from the drop-down list. If needed, click Add group from the drop-down list to add a new group. Bundled Fees are typically used for those offering a tiered dues membership. Bundled fees allow the ability to include a single line item on an invoice but report to multiple income accounts for internal bookkeeping. NOTE: Before creating bundled fees, you must first create Regular Fee Items. Click Fee Items List in the Billing area. The current list of Fee Items display under the List Options filter. Select the Bundled Fee radio button. Fee Item Name: Title for the fee item; will be used by default to identify the fee item in a member's transaction history. Item Type: The item type dictates where the fee item is used in the software. Select an Item from the drop-down list. (Optional) Select Class from drop-down list. Edit Price if needed. NOTE As items are added, the Price of the bundle is totaled. Click the Add Item button to continue adding items to the bundle as needed. Use the following procedure if you wish to update a fee item that is currently associated to a record in your database. For Example: If you wish to update membership pricing, you may do this from the Fee Items screens, and updates will be applied to all future billing of the item. Click Fee Item List in the Billing section. To the right of the fee item name click Edit Pricing. The view detailed list link will allow you to generate a list of the members associated to this fee item. This list can be used to change the price of a fee item for individual members. Fee Item Pricing: In this section you will have several different ways to update pricing. Update all members to a specific price: Enter a new price in the Fee Item Pricing box and click the Update all associated to link. You will be presented with a dialog box informing you of the number of associations that will be affected. Click OK to proceed or Cancel if you do not wish to update all. Change rates by a percentage or flat rate: Click the Change All Rates button to increase all of the members tied to this fee item by a percentage or a flat rate. NOTE: Click the Save Changes button after making any changes in the Fee Item Pricing area. In the Fee Item Pricing: Variation Breakdown section a list of variations in the price of this fee item is displayed. You may change the price for one, more or all then click Update to update the pricing. Description: In this section you may update the description of this fee item. NOTE: Click the Save Changes button after making any changes in the Description area. Billing Frequency: This area allows you to see what frequency each member is set as and what members are assigned to each frequency. All members tied to this frequency will be updated if any changes are made. If you change the account to which a fee item has been assigned, the account assignment for existing invoices will NOT be updated. If you wish to update, you will need to back into each individual invoice and save to update the account. Exception: If the account that was originally assigned to the fee item was the "Income account" (now 'blank') it WILL automatically apply to the existing invoices immediately. Once an account is changed on an invoice, it will immediately show that account when viewing the JEE. Existing receipts will automatically update to the new account that fee items are assigned to. You do not need to go in and save these - they automatically update. Click Here to view a video on setting up your tax items. Setting up your taxes is a two step process, you must first create your tax items, then create your tax item sets. To setup your tax items, click Manage Tax Items. Tax Rate: Enter the tax rate for this tax item. Sales Tax Name: Enter a name for this tax item. The name is required, and visible in the back-office when creating tax sets. Tax Agency: (Optional) Enter the tax agency. Tax Account: Select the account to be used for tax revenue. This account must have been created within your Chart of Accounts. Description: (Optional) Enter a description of the account. Status: Select the status of the account. When status is set to Active it is available for selection in the back-office. When set to Inactive it is not available for selection when applying taxes in the back-office. Best practice is to de-activate tax items that you are no longer using. Display Order: Select the order in which you want to list the tax items on the tax list. Billing Day to Day Activities View this video for an overview of the daily activity as it relates to billing: creating invoices, posting payments, issuing credits, running reports, etc. Includes information on what the difference is between a payment and a receipt as well as when to use credits, discounts and write-offs. (NOTE: this training is not intended for those using the legacy CQI integration) Length: ~15 minutes. The Mbr Payments item in the Task List will indicate payments that have been received that have not been tied to an invoice. This may be the result of a member making an additional payment in the MIC, a membership application submitted where either Fee has been set as the Fee Type, or the membership application has been paid by credit card and your system is not configured to automatically create an invoice. NOTE: Entries that have a status of "New Payment" have a payment transaction created. If you have setup your membership application form to accept credit cards, but you are NOT auto-approving the applications, the credit card payment will show in the Task List under Mbr Payments. The In this scenario, you will need to create an invoice/receipt for the payment. Whether you create an invoice or receipt is dependent on your settings. Click the Mbr Payments link in the Task List. Payments received for on-line membership applications will be identified as New Membership Application in the Auth Code column. Click the Details link to view further information about the Mbr Payment if needed. If New Payment is displayed as the Status, the payment transaction has already been created. Copy the TXN Id. Click Create Invoice for the desired applicant. If the package selected was assigned Fee Items the invoice will automatically be populated with the fee items. If the package the applicant selected was assigned Fee you will need to select the fee items to add to the invoice. Click Save to save the invoice. Click Apply Payment for the desired applicant. Select the invoice to which you wish to apply the payment. On the Member Application Requests screen, click Approve for the applicant. Click Mbr Payments in the Task List. For the applicant's payment, select Completed from the Status drop-down list. When members enter additional payments via the MIC, you will need to either apply that payment to an existing invoice, or create a new invoice to which you will apply the payment. Click the Mbr Payments link in the Task List. Payments received from an additional payment made in the MIC will display the comments entered by the member in the Auth Code column. If needed, click the Details link in the Action column to view further information about the payment. Comments entered by the member will be displayed, and your staff may also add comments. Click the link in the Billing Txn column. This column will display the credit card type and the last four digits of the card. The Apply Credits & Payments screen will display a list of all open invoices. By default, the oldest invoice(s) will be selected. If you wish to select alternate invoices, deselect the default, and click the check-box(es) for the invoices to which you wish to apply the payment. On the member's Account tab, you will be able to see that the invoice(s) selected has been paid, and the payment transaction displays that it was applied to the invoice(s). Click the name of the member in the Member column. On the member's Account tab, click New Invoice in the Transaction History section. Notice that a payment record has been created for the member's additional payment. Click New Invoice. Create the invoice as described in Create a Single One-Time Invoice, ensuring that you select the fee items that are appropriate for the payment. Once the invoice is created, click the payment Ref # for the payment you wish to apply. 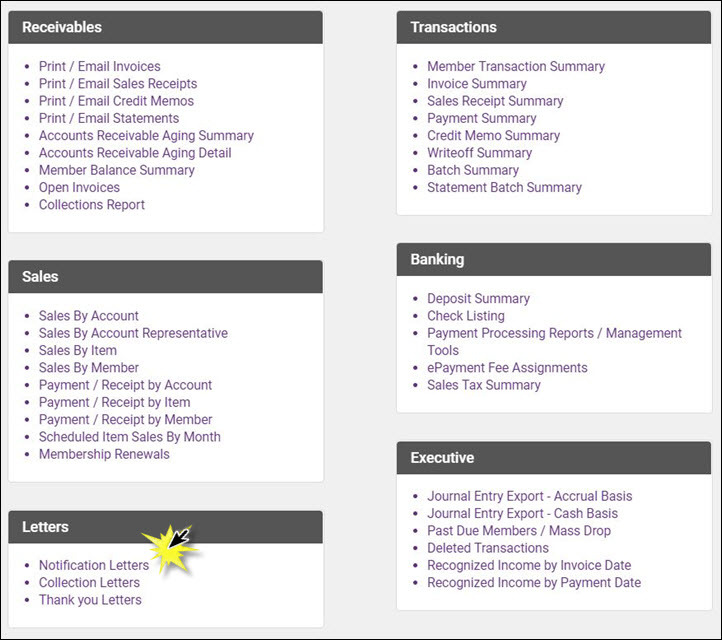 If the member has other open invoices, the Apply Credits & Payments screen will display a list of all open invoices. By default, the oldest invoice(s) will be selected. If needed, de-select the invoice selected, and select the check-box for the newly created invoice. Notice the Transaction History for the member will now display the newly created invoice with no balance, and the un-applied payment tied to that invoice. Creating a single invoice may be done within the Billing Center or on a member's billing tab. Click Billing in the left-hand menu. Click the Billing Center tab. Click the desired member in the member list. A/R Account: Select the A/R account your wish to use for this invoice. The default you selected under Billing Options & Settings will be displayed, but you may change this as needed. Invoice Date: The invoice date will default to the current date, but you may change this as needed. Invoice Number: The system will automatically generate the next invoice number for you. P.O. Number: If you have a PO Number you may enter it here. If you receive the PO Number after you have sent the invoice, this field may be updated. Date Due: The date due is calculated by the Payment Terms described below. If you wish to specify a date due, you may enter it in this field and it will override the payment terms. Payment Terms: Select the payment terms for this invoice. The payments terms you set as default under Billing Options & Settings will be displayed, but you may change this as needed. Click the Payment Terms hyper-link to add or edit payment terms. Message: Select a message to display on your invoice. The message you set as default under Billing Options & Settings will be displayed, but you may change this as needed. The drop-down list will contain all messages you created in the Billing Options & Settings. Click the Edit button if you wish to make changes to a message. Sales Tax: If the items on this invoice are taxable, select Tax from the drop-down list. Modify the *Sales Tax sets under Setup->Define Sales Tax Rates. Notes/Memo: Enter any notes/memos you wish for this invoice. Item Name: Select the fee items that you wish to include on this invoice. The Description and Price Each will be populated with the defaults you configured when the fee item was created. You may change these if needed. Qty: Enter the quantity of the fee item to be included on the invoice. Sales Tax: If the fee items is taxable, select Tax from the drop-down list. The tax will be automatically calculated. Amount: The system will automatically calculate the total amount for the sale. If you wish to defer recognition of the revenue for this invoice, click the Edit Revenue Recognition, the # of Months Recg. column will be displayed. Enter the number of months over which you wish to recognize the revenue. If you simply wish to ready this invoice for delivery, select the appropriate delivery method Invoice is marked to be printed or Invoice is marked to be emailed. (Optional): If the member has available credits, click the Apply Credits button. When payment is received, you can enter a payment in one of three locations: the Billing Center tab or Payments tab in the Billing module, or the Account tab in the Members module. Select the deposit account to which funds should be deposited from the Deposit To drop-down list. Click Here for more information on deposits. Complete the payment information fields including: Payment Amount, Payment Date, and Payment Method. Optional: Fill in the Reference number of Notes/Memo field as desired. Reference number may contain the check number or last 4 digits of credit card or other identifying information. Notes/Memo is available for miscellaneous notes displayed on the payment. If selecting Credit Card and then capturing the credit card payment right away, then the Reference number and Notes/Memo will automatically be filled in. If selecting Credit Card as the Payment Method, the Capture Payment button will appear. Click Capture Payment and complete the credit card information screen. The credit card will be processed with the amount specified in the Payment Amount field. NOTE: The Capture Payment button is only available for Plus users that have Authorize.net, Beanstream, IPP, or PayPal Website Payment Pro processing. If you are using a 3rd party credit card processor, you will simply select Credit Card as the payment method. In this case, best practice is to enter the last four digits of the credit card in the Reference Number field. To apply the payment to a particular invoice(s), click to select the checkbox in front of the invoice that this payment applies to. Deselect any invoices that do not apply, by default, the oldest invoice will be selected. If desired, click Print or Email to print/email a payment receipt. NOTE: If you wish to print a Paid Invoice, you can do this by reprinting the invoice to which this payment has been applied. The appropriate fields must be included in your invoice template. Click Mbr Payments in the Task List to view the incoming payment. Click the Details link to view further details of the over-payment. Copy the PN Reference #. On the Billing Center tab, select the member who made the payment. If the over-payment is to be applied to an open invoice, click the New Payment button. Enter the PN Reference # copied from the details in the Reference # field. Select Credit Card as the Payment Method. NOTE: Do not Capture Payment, as the card has already been processed. Select the invoice(s) to which you wish to apply the payment. Select Completed from the Status drop-down list for the payment you applied. The payment will be removed from the list, and from the Task List. It is inevitable that a check will be returned by the bank due to Non Sufficient Funds (NSF). So what is the best way to record this in your database?​ In essence, a NSF is handled almost the same as a Refund except that you are leaving an invoice open on the account after it is all said and done. Use the ‘Refund Payment’ option to reverse that payment. Next you will need to create a new invoice for whatever that original payment was for. This re-opens the balance for that customer. Add any necessary NSF fees to this new invoice for the returned check. Alternatively you can go into your accounting software and record the returned check on the check register manually. The Payment Summary Report allows you to generate a list of all payments received in a selected date range, for a specific batch, payment method, item type, item basis, or class. Click Payment Summary in the Transactions section. Enter the desired date range in the Date From and Through text boxes. Click the more... link to choose a pre-defined date range. Show Active/Courtesy members only. - If you wish to see all payments, de-select this option. Specific Batch - If you wish to view payment history for a specific batch, click Choose Batch. Payment Method - If you wish to see a specific payment method, select an option from the list. Item Type - If you wish to generate the report for a specific fee item type, for example Membership Dues, select an option from the list. NOTE: You may also select a Specific Fee Item. For Example: if you wish to see payments on specific event fee items, click Use Specific Fee Item and select the desired fee items. Item Basis - If you wish to generate the report for a specific accounting basis (accrual vs. cash), select an option from the drop-down list. Click Refresh Report to generate the report. A receipt is created when accepting money on a Cash Basis. If you are receiving money to pay off an invoice, make sure to receive a payment instead of creating a receipt so the invoice can be marked as paid. The Sales Receipt Summary report will display sales receipts transactions. Sale Date defaults to the current date. The Sale Number automatically displays the next available Sales Receipt Number. (Optional) Enter a Payment Reference # that displays on this transaction, often the check number or some other unique identifier. If capturing a credit card payment, this will be filled in automatically after processing the card. (Optional) Select a Message if desired. (Optional)Sales Tax: Choose the desired Tax Set if necessary. (Optional)Notes/Memo: is available for miscellaneous notes displayed on the credit. If capturing a credit card payment, this will be filled in automatically after processing the card. Note: If Transaction Classes have been created, a Receipt Class drop-down selection will appear on the screen. Select the desired Class for this transaction. If needed, select a different Class assignment on each line item. Ensure that the Deposit To: drop-down selection is the desired account for funds to initially be deposited. Note: See “Selecting Payment and Receipt “Deposit To” Account” for more information. If selecting the “Credit Card” Payment Method, then you may actually process the card right now if you have credit card information. Click Capture Payment and complete the credit card information screen. The credit card will be processed with the total of the line items. Note: Capture Payment button is only available for Plus users that have Authorize.net, Beanstream, IPP or PayPal Website Payment Pro processing. Select the desired items from the Item Name list. The system will populate the price you have initially configure for the fee item, you may over-ride this if necessary. The Quantity field will automatically default to 1, update as needed. Continue adding items as needed. NOTE: If desired, click Print Now and follow prompt on-screen to print the sales receipt. From the Reports tab in the Billing module, click Sales Receipt Summary in the Transactions section. A credit may be created for a member ahead of time or created when receiving the payment. Credits do not have to be associated with a particular invoice when created. In contrast, discounts must be associated with a particular invoice. The Credit Memo Summary report will display credit transactions. Credits can be done using any fee item that exists on your items list. Keep in mind that whichever fee is selected will decrease the income account that is assigned to that item. In some instances, you could select the item that is the reason for the credit needing to be created (i.e. A credit is being issued for a cancellation to the annual dinner. Create the credit and select the annual dinner fee item. This will decrease the amount of income reporting on the financial statements for that event). If you are unsure as to which item should be selected you will want to check with your accountant, as this will affect your financial statements. On the Billing Center tab, select the member to which you want to issue a credit. Complete the credit information fields if needed. Credit Date defaults to the current date and the Credit Number automatically displays the next available credit number. Optional: Enter a P.O. Number if applicable. Select a Message if desired. Notes: is available for miscellaneous notes displayed on the credit. Note: If Transaction Classes have been created, a Class drop-down selection will appear on the screen. Select the desired Class for this transaction. Select the Assigned Item for this credit. NOTE: The account associated to the fee item will be debited the amount of the credit immediately, not at the time that the credit is used. If a member has an open invoice, you may apply a credit to that invoice prior to receipt of payment. Click the invoice to which the credit should be applied. Click the New Transaction drop-down arrow. If multiple credits are available, select the desired credit from the Credit # drop down list. On the Billing Center tab, click the member from which you wish to receive payment and apply discount. Click the invoice number to be paid. On the invoice screen, click add/view payments. If credits are available, the Apply existing credits to this invoice radio button will be enabled and the amount of available credit will be displayed. In the list of Open Invoices, ensure the correct Invoice Number is selected the list. Type the amount of credit to be applied in the Amount to Use field. The full amount of the credit will be populated if applicable. On the Payment History screen, if a balance remains on the invoice, the Make a payment toward this invoice balance. radio button will be enabled. To make the payment click continue. Complete the Payment screen as desired and click Save Payment. Deposits are only available when payments and receipts have been deposited into the Undeposited Funds account. for more information on the undeposited funds account. (Optional) Click Apply Filters to narrow the list by payment method. Select the payments to be deposited from the Select Payments to Deposit list. By default all payments will be selected, but you may deselect those that you do not wish to include in this deposit. Select a Cash Back Account from the drop-down list. If you wish to add a new account, click the Cash Back Account hyper-link. (Optional) Enter a Cash Back Memo. Enter the Cash Back Amount. (Optional) Click Print Listing, Download Listing, or Print Deposit to create desired output. Click Save Deposit. The payments you have selected will be included in this deposit. Note: If planning to export your transactions to QuickBooks or other 3rd party billing software, making a deposit using Integrated Billing deposit options does not take away your option of being able to create a deposit in QuickBooks. The Integrated Billing deposit transaction can be excluded from your export, allowing you to also make the deposit in QuickBooks. The Deposit Summary report will display deposit transactions. Click Billing in the left had navigation panel. On the Reports tab, click Deposit Summary in the Banking section. The report will generate for the default date range and all deposit accounts. To generate the report for a different date range, enter the desired date range in the Date From and Through text boxes. Click the more... link to choose a pre-defined date range. (Optional) If you wish to view a specific deposit account, select an Account from the drop-down list. If a member does not pay, it is possible to write-off a balance. You may wish to have an account in your Chart of Accounts where these amounts will be recorded. Write-offs can also be done [[Mass Write-Offs|in mass when dropping members with the Mass Drop feature. On the Billing Center tab, select the appropriate member. Click the invoice to be written off. Click Write-off balance. The Invoice Write-off screen will display. The Writeoff Date will automatically be populated with the current date. The Writeoff Amount will be populated with the full amount of the invoice, you may change this if you wish to do only a partial write-off. Select the account you wish to use for this write off from the Expense Account drop-down list. If you wish to add a new account, click the Expense Account hyper-link. (Optional) Enter Notes / Memo for internal use. Note: If Transaction Classes have been created, a Billing Class drop-down selection will appear on the screen. Select the desired Billing Class for this transaction. Click Past Due Members / Mass Drop in the executive section. Click Generate Report to see a list of all members with over-due member fees and dues. Select the members you’d like to drop by checking the box in front of their name. Ensure the correct drop date is listed above along with the desired Drop Reason and Drop Comments. If you’d like to write-off all the open invoices to their original accounts, check the Write-off member balance(s) check mark and enter the desired write-off date. Recommend: Select Disable rep(s) in group(s) so that reps will no longer be included in communication to the group. all member invoices will be written off back to the original account that was billed. Members that have unapplied payments are marked with an * and will not be able to be included in the write-off. You should check out this member manually and see if these payments could be applied prior to dropping. all reps will be marked as Disabled in their groups which means that they will no longer receive communication to that group but staff can see them as "greyed out" when viewing that group which lets you know that they did belong to that group at one time. if not selecting this checkmark, reps will remain in the groups unchanged but will display as inactive (red) due to dropping the member. They would still receive communication to any groups they belong to. Regardless of this checkmark, these reps are marked as Inactive reps on the Members->Reps tab. Voluntary fees will be written off back to their original account if you are currently set to export all voluntary fees (paid and unpaid). Contact customer support if you'd like to get to a point where you only export paid voluntary fees. Processing a refund may be performed through the Billing module (on the Payments page) or on an individual member's Account tab. Follow the instructions below to process a refund from the member's account tab. On the member's Account Tab, click the hyper-link for the payment you wish to refund. On the payment screen, click the Refund Payment button. The information displayed at the top of the screen, shown below, was captured when the payment was made and should not be edited. To give a partial refund for the payment, change the Price Each field to the amount you wish to refund. Note: The Members' Account tab will list this transaction as a Receipt but will show the description as "Refund". Scenario #1 – If there is an unapplied PAYMENT showing that they need to refund to the customer. Look at the JEE-Accrual basis to see what Accounts Receivable the original payment was tracked under. Create a new INVOICE, for the same dollar amount as what the refund is going to be, using the Accounts Receivable account determined in step 1. The fee item that would be used doesn’t matter. Open the unapplied PAYMENT transaction so that you can apply it to the newly created invoice. Open the applied payment and select Refund Payment. The original accounts are already selected and will be reversed. Click Save. Follow up by issuing a check out of the accounting system’s check register debiting the necessary income account and crediting the bank account. The transaction is not exported because the issuing of the check or recording of the credit card reimbursement in their accounting software, has already accounted for this. Refund transactions are hidden from the export by default. Scenario #2 – If the customer’s account has a zero balance. Find and open the payment that was applied and select Refund Payment. The original accounts are already selected and will be reversed. Click Save. Scenario #3 – If there is an unapplied PAYMENT showing that they need to partially refund to the customer. Create a new INVOICE, for the same dollar amount as what the refund is going to be, using the Accounts Receivable account determined in step 1. Make note of the fee item that is being used (in description on invoice even put some note to track refund). Open the original PAYMENT again and select the REFUND PAYMENT option. Reset any line items that are not part of the refund to a ‘blank’ status so that they are not part of the transaction. The transaction is not exported because the issuing of the check, or recording of the credit card reimbursement, in their accounting software, has already accounted for this. Refund transactions are hidden from the export by default. Scenario #4 - If a refund needs to be created for a Sales Receipt transaction. Select the NEW SALES RECEIPT icon, and manually record a refund by selecting the same line item as what was used on the original sales receipt and enter the amounts as negative amounts. If this refund needs to be tracked due to an event and tracking is desired within the event module as well, adjust the registration fee amount within the event by decreasing it by the same amount as the refund, or by removing individual attendees. The above procedures do not require any deletion of transactions. At this time, this feature is only available for payments and not Sales Receipts. Refunds will not be included by default on the journal entry export for either cash or accrual basis but could be included by selecting the "Show Refunds" checkbox. Because the reversal is often handled in your accounting software through cutting a check or other manual reversal, the refund transaction is typically omitted from the export. The transaction happened around or after 4/1/2014 which was then code was implemented to record the Authori.Net AIM transaction ID. A discount may be applied to a particular invoice at the time of payment or prior to payment received. A discount is associated with a specific invoice and may only be removed by accessing the assigned invoice. In contrast, Credits do not have to be assigned to a particular invoice. There are two types of discounts within the ChamberMaster/GrowthZone database. Event discounts and Invoice Discounts. This page contains information about Invoice Discounts. See Event Discount Options page for event discount information. On the Billing Center tab, select the member from the member list. Click the invoice to which the discount is to be applied. Type the Discount Amount, Notes/Memo (if desired), and double-check the Discounted Item and Discount Account. On the Billing Center tab, locate the member from whom you have received payment. Click the invoice number to which you want to add the discount. From the New Transaction drop-down list, select Add Discount. The Invoice Discount screen will display. Note: The Discount Account must be identified as an Income account in Setup->Chart of Accounts. In Figure 3-19 above, a special Income account titled “Membership Dues Discounts” has been created that will maintain a list of discounted membership dues specifically for keeping track of early payment discounts. If Transaction Classes have been created, a Class drop-down selection will appear on the screen. Select the desired Class for this transaction. Discounts are associated with a particular invoice and thus must be removed from the assigned invoice. Locate the desired invoice where a discount should be removed. Click Show Balance Summary (if not already selected). Click the Discount ID #. The Statement Date will default to the current date. Select Filter by Statement Period and enter desired dates. Only invoices created in the date range will be included in the statement, with Balance Forward carried over if applicable. OR click the Open Transactions as of Statement Date option. This option will include all open transactions in the statement. You may choose to Include only transactions X or more days past due and/or Include only transactions containing items of type (select the item type from the drop-down list). OR include transactions from a Specific Batch. 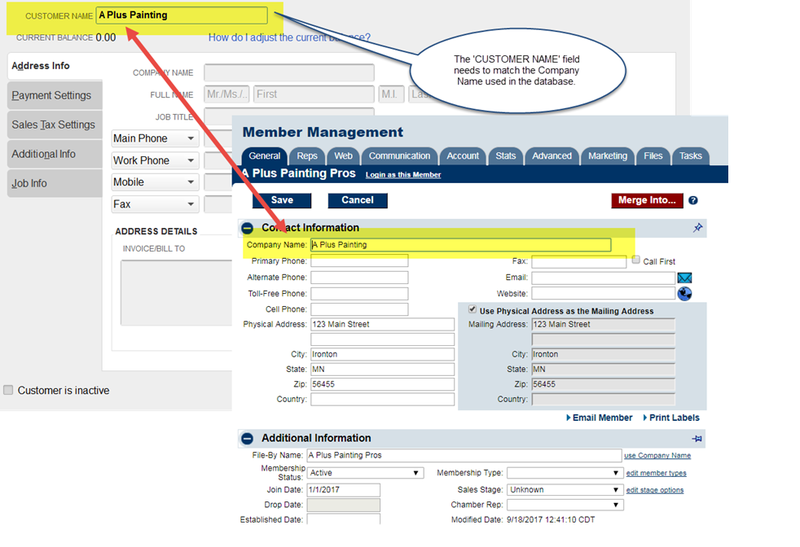 Select Eligible Member Records: You may select All Members or filter by Specific Members. Output: Select Print, Email or Contact Preference. Message: Select the message you would like to include on the statement. You may click the edit button to make changes to the message. Note: Messages are configured under Setup > Billing > Customer Messages. Include dunning messages for past due customers: A Dunning message may be displayed on invoices that meet the criteria. Dunning is the process of methodically communicating with customers to ensure the collection of accounts receivable. Selecting to include the Dunning Message for past due customers will place a message on their statement based on how overdue they are. Different messages are available for those with no overdue items, 30, 60, 90, and over 90 days overdue. These messages may be edited when clicking into view the dunning messages. Show voluntary fees on statements: If this option is selected, invoice that include unpaid voluntary fees will be included on the statement. Show invoice item details on statements: Select this option if you wish to display the individual invoices on the statement. Show available credits on statements: Select this option if you would like to display open credits on the statement. Show available payments on statements: Select this option if you would like to display un-applied payments on the statement. with a $0.00 balance: Select this option if you do not wish to create statements for members with zero balances. with a balance less than X: Select this option if you do not wish to create statements for members with a balance less than the dollar amount entered. with no account activity: Select this option if you do not wish to create statements for members with no activity on their account. with a member status other than Active: Select this option if you wish to only create statements for Active members. If you wish to print statement for all members, regardless of status, de-select this option. Click Print/Email Statements. The Deliver Statements window will appear. The Delivery Method of Print Statements is already selected. Those invoices with a complete mailing address will be selected. NOTE: Those statements without a complete mailing address will not be able to be selected until a complete address is entered on the Billing Reps record. Return to the Members module, locate the desired member, click the Reps tab and edit the address for the rep marked as the Billing Rep. When ready, click Preview Statements or Print Statements.</span>. If mailing labels are desired, click Print Mailing Labels in the Delivery Methodsection. If any statements need to be emailed, click Email Statementsin the Delivery Method section. NOTE: Those statements without a complete email address will not be able to be selected until a complete address is entered on the Billing Reps record. Return to the Members module, locate the desired member, click the Reps tab and edit the email address for the rep marked as the Billing Rep.
A Thank You letter report may be generated for those members who have paid their invoices. Once generated, you will be able to easily send Thank You letters via email or print. Various filters are available to allow you to identify members. For example, you can filter the report by Membership Fees/Dues, and easily be able to thank your members for renewing. Templates may be created to customize your thank you letters, and make it efficient to send out the letters. Select Thank You Letter from the Transaction Type drop-down list. OR enter a name for the template in the Template Name text box, and click the Save As Button. Click Thank you Letters in the Letters section. Payment/Receipt Date From/Through: If you wish to identify paid invoices for a particular date range, enter the dates. OR click into the more... hyper-link to select a range (this month, this quarter, etc.) OR if you do not wish to filter by date range, click the more... hyper-link and select Do Not Filter. Include Sales Receipts. Select this check-box if you would like sales receipts included in the report output. Show Active/Courtesy members only. : Clear this check-box if you would like to include Dropped/Inactive, Prospects and Non-members in the report output. Specific Members: Click this radio button if you wish to generate the report for specific members. You can then click add by Company Name, add by Membership Status or add by Membership Status to select members. Include voluntary fee items in balance. Letter Template: Select the Thank You Letter template you wish to use. You may click the Letter Template hyper-link to edit the template. Output Option: Select the desired output option for the letters. Sales Rep: If you wish to generate the report by Sales Rep, select the desired Sales Rep from the drop-down list. This would be used if you wish to generate the report and send personal letters from sales reps. Item Type: If you wish to generate the report by a specific item type, select the type from the drop-down list. For example, if you wish to only include membership dues, select Membership Fees/Dues. Alternately, you can filter the report to specific fee items by selecting Use Specific Fee Item, then selecting the desired fee item(s). Item Basis: If you wish to filter the report by Accrual or Cash, select the desired option. Member Join Date From/Through: If you wish to filter the report to those who joined between certain dates, enter the desired dates. Click Refresh Listing. The report will be generated based on the filtering criteria you selected. Double-check the Output column to ensure the correct delivery method is selected for each member. If you do not wish to create letters for certain members, select None in the Output drop-down list. Select the radio button for the desired Delivery method: Email or Print Letters. The list of recipients will be filtered to the output selected on the previous screen, you may remove recipients by deselecting them in the list. If selecting Email, double-check the Email From address and Subject Line and then click Send Emails. NOTE: If you wish, first click Preview Emails. If selecting Print Letters, choose the items you would like included in the letters. Include return address should be selected if you want your association return address be placed at the top of the printed output. To log the letter to the members' Communication tab, click the Create communication log entries check-box.. If needed, click Create Letters again and select Print Labels as the Delivery Method to print matching labels for the printed letters. Collection letters are intended for those that have not paid for their invoices. Select who should receive these letters and which letter they should receive by selecting the appropriate filter choices. Click Collection Letters in the Letters section of the Reports tab. Aging: Select aging options if you want to filter the collections report to invoices that have aged beyond a certain number of days. Specific Batch: If you wish to filter the report on a specific batch, click the Choose a Batch (optional) hyper-link and select the desired batch. Letter Template: Select the Collections Letter template you wish to use. You may click the Letter Template hyper-link to edit the template. Output Option: Select the desired output option for the letters. Selecting Contact Preference will set the output to the preference configured on the Account tab for the member. Double-check the Output column to ensure the correct delivery method is selected for each member. If you do not wish to send the collection letter to certain member(s) set the output method to None. Select the desired Delivery method: Email or Print Letters. Notification letters may be sent prior to the member billing month thanking them for their membership and notifying them that their membership dues will soon be billed. Click Notification Letters in the Letters section. Sales Month: Select the desired renewal month from the drop-down list. Include Monthly, ACH and One-Time Invoices. Include voluntary fee items in amount. Letter Template: Select the Notification Letter template you wish to use. You may click the Letter Template hyper-link to edit the template. Double-check the Output column to ensure the correct delivery method is selected for each member. If you do not wish to send the notification letter to certain members, select None. Fees may be assigned to a group or to certain individuals within the group. Groups may be created by you as desired to accommodate your billing needs or you may use groups that are already created. Fees are created by selecting Group Fees as the Item Type. In the Groups module, fees are assigned to an entire group and then the amount may be modified per individual if desired. However, all group members will be billed using the same frequency. To create invoices for a group that has been assigned a fee item with a One-Time Billing Cycle, Bill Group Now must be selected on the Group Fees tab. Creating invoices for a group that has been assigned a fee item with a Billing Cycle of Annual, Semi-Annual, Quarterly, or Monthly, allows you to invoice from the Billing module by selecting the Group Batch Type and the appropriate Billing Month. These fees are treated as recurring fees and will be included automatically in Group billing batch. If your group(s) should be billed on a regular basis, setting the Billing Cycle to Annual, Semi-Annual, Quarterly, or Monthly would be recommended, especially if billing multiple groups each month. To create the invoices only requires only a few simple selections in the Billing module each month. Contains steps for setting up Event fees and creating event invoices. Creating batches of your recurring invoices (For Example: Membership Dues) can be done through the Billing Module on the Invoices tab or from the task list. The instructions below will show you how to create your batch from the Task List. Click Invoices in the left-hand menu. If there is not a number next to invoices in the task list, then you have now invoices to batch. Note the Assigned fees for drop down. The month selected by default is driven by the Months to look ahead setting in your Billing Options & Settings. Invoices displayed as Recurring Fees Batches and Group are identified by this setting. One Time Fees, such as Setup Fees, and Event fees will simply display on your list regardless of the Assigned Fees For setting. To generate invoices for your recurring fees, click the create invoices hyper-link next to the desired Batch Group in the Recurring Fees section. If this is the first time you have run a batch for the selected renewal month, New Batch will be displayed. If you have previously created a batch of invoices for this renewal month, but additional invoices need to be created, Match Found will be displayed. When Match Found appears, scroll down and click New Batch. If a match was found it means you’ve already invoiced this particular set of invoices. If there are some additional invoices that need “added to this batch”, you would want to create a new batch. If you proceed without creating a new batch, previous invoices batched would be updated to any changes made to terms, dates and payment options. Selecting New Batch is typically a better, safer idea. Complete the rest of the fields including Invoice Date, Date Due, and Payment Terms. If Transaction Classes have been created, an Invoice Class drop-down selection will appear on the screen. Select the desired Invoice Class for this batch of invoices. NOTE: If only viewing the invoices when, clicking Deliver Invoices, the invoices will be created. If you clicked Deliver Invoices and do not want this batch created, close the Deliver window and click Delete Batch. Uncheck any invoices that should be excluded from this Batch. Note: Excluded invoices may be added to this batch or placed in a new batch later. ChamberMaster/GrowthZone will be the place for viewing and reprinting member transactions. QuickBooks is just recording a journal entry and doesn’t actually contain the invoice or payment. Verify your Chart of Accounts: Before performing an export, you will want to compare the Chart of Accounts in ChamberMaster/MemberZone to the Chart of Accounts in Quickbooks. Accounts in CM/MZ must match either the exact names or exact numbers given to your Chart of Accounts in Quickbooks. See Modify Chart of Accounts for information on viewing your chart of accounts. Check Transaction Classes (if applicable): If using classes in Quickbooks, ensure that the transaction classes used in ChamberMaster/MemberZone match the transaction classes in Quickbooks. Class names must match exactly the Class Name in Quickbooks. See Transaction Classes for more information on viewing and updating transaction classes. Check Fee Items: Make sure the Fee Items you have setup in CM/MZ are assigned to the correct Accounts. See for instructions on viewing/modifying fee items. Check Sales Tax Items: If you are charging Sales Tax, verify that each tax item is also assigned to a matching account. See Setting Up Sales Tax for information on viewing sales tax sets. Check Customer Names: Check your Quickbooks customer names. Customers who exist in your CM/MZ database (under Company Name), but not in your Quickbooks company file must be added to Quickbooks exactly as they appear in your database. For customer names you already have in QuickBooks, you will want to ensure that the QuickBooks Customer Name matches the Company Name in ChamberMaster. These two fields are the comparison fields used for making sure the transaction goes on the correct customer record. If there are any differences in spelling or punctuation, the import will fail. Compare these two lists by viewing the QuickBooks Customer Contact List under Reports with a Custom Report in ChamberMaster where you might only need to select the Company Name. Fix any discrepancies between the two customer lists. You may also run the Member Activity Update report to look for any company name changes. It’s always a good idea to test out sample transactions before importing a large number of entries. So before any other transactions are created for the day*, go into the Billing module and create a couple of sample entries. Make sure to choose a member that exists in your Member database and also as a Quickbooks Customer. The Quickbooks Customer name needs to match the Member database name exactly – letter by letter. Remember the transactions you create, because you will delete them when you are done testing. Accrual Basis – will display ALL possible transactions that match the selected filter options. Cash Basis – will display ONLY Payments and Receipts that match the selected filter options. You should see your transactions. If not, click the Refresh Button. Note the Account Names that are being referenced. These are the general journal entries that will be made in your accounting software. If needed, deselect any transactions that are not part of your sample entries. If prompted, save the file to a location you will remember. Locate the saved export and select. Look at the general journal entries that were created in Quickbooks by clicking Company, Make General Journal Entries. If desired, double check any reports and accounts to see how they are affected by these journal entries. Now that you’ve seen how it works, go ahead and delete each of the 3 general journal entries. In Quickbooks, select Company, Make General Journal Entries. Click Previous to return to your sample entry. Select Delete General Journal Entry from the Edit menu. Do this for each of your sample entries. The transactions are now cleared from your journal, the customer account, and your deposits screen. Log into CM/MZ and delete the sample payment, invoice, and sales receipt. Exporting should typically be done for the previous day(s) – not the current day. This will ensure that all transactions are included for the date or date range specified. Go to Reports on the left hand side. In the Report Finder type in the search box “Update”. Click on the Member Record Updates Report on the right. Click Billing in the left hand menu. Make any desired filter option selections. Exclude Deposit Transactions: If you received funds into Undeposited Funds, and then made a deposit in CM/MZ, select Exclude Deposit Transactions if you want to perform the deposit in QuickBooks. Your payments and receipts will then display in the QuickBooks Banking, Make Deposits menu so you can create a lump sum deposit in QuickBooks and include other monies as well, if desired. Show Deposit Transactions Individually: If you received funds into Undeposited Funds, and then made a deposit in CM/MZ, select Show Deposit Transactions Individually if you want this deposit brought through to QuickBooks. Your total deposit amount will be posted as a journal entry on your bank account in QuickBooks. *note - Follow-up in QuickBooks by clearing out the “in and out” transactions in the deposits screen. Select Banking, Make Deposits and create a $0.00 deposit that includes both the positive payment amount and the negative deposit amount displayed. Route Directly to Deposit Accounts: If you received funds into Undeposited Funds, and then made a deposit in CM/MZ, select Route Directly to Deposit Accounts if you’d like to bypass the Undeposited Funds account and deposit directly in your bank account in QuickBooks. You will not be able to perform a deposit in QuickBooks, instead the individual payment amounts will be posted as a journal entry on your bank account in QuickBooks and on the appropriate customer account in Accounts Receivable. To ensure you don’t export a transaction multiple times, make sure the check box “Save Export Batch” is selected. Browse the transactions for any missing account assignments or anything unusual. If any transaction does not look right do not import until the transactions has been corrected in the billing module. Save the file to a location you will remember. Login in to Quickbooks as an Administrator and make sure you are in Single-User Mode. Quickbooks Administrator – person who sets up the company file and assigns passwords/access privileges to other users. If there is an Administrator setup, it appears in the User List as either Admin or User Name (admin). To view your user list go to Company Menu, click Set Up Users and Passwords, then click Set Up Users. Single-User Mode – Quickbooks must be in single-user mode in order to import. To place Quickbooks in single-user mode, if others are working with the company file, as them to either close the file or exit Quickbooks. Then go to File and click Switch to Single-User Mode. View Imported Journal Entries by selecting Company, Make General Journal Entries. Find out what record caused the error. When you get the first error click okay then cancel on the 2nd one. Go to ChamberMaster and pull up the Journal Entry Export report for that same date range. Find last person that imported successfully and look at the next one on the list. This record is the one that is causing the error on your import. Now that you know what record caused the error you need to identify the problem. It could be an issue with the name on the record. If the record isn't a customer they could exist as a Vendor or on the Other Names list. To work through these the best thing to do is change the name in QB by adding a -v at the end of the name. Once the issue is resolved you will need to go into ChamberMaster and re-export the records that weren't imported starting from the failed to the end. When you first run your Journal Entry Exports for the first few months you will need to apply the payments to the correct invoices in Quickbooks in order for the invoices to not show as open anymore. Customer and Receivable reports would typically be viewed in ChamberMaster/GrowthZone. However, if you desire to also view these reports using QuickBooks, you may want to apply payments to the open amounts in QuickBooks. General journal payments posted on the customer account will properly decrease the customer balance. However, the payment is not applied against any particular invoice (open amount) since it is general journal entry; it will still show an open amount in QuickBooks. A list of “outstanding” invoices will display. Click the invoice that should have the payment applied. Click Discount & Credits button. Make sure the desired “credit” (your payment from the import) is selected. See for steps to ensure your export/import to Quickbooks online is successful. Click Here to view a video on applying payments with Quick Books On-line. Before performing any exports, you will want to verify that the Chart of Accounts in ChamberMaster/MemberZone accurately reflects the Chart of Accounts in Peachtree. The Account ID entered in ChamberMaster/MemberZone should exactly match the Account ID in Peachtree. for instructions on viewing/modifying your Chart of Accounts. Verify that the Fee items setup in ChamberMaster/MemberZone are assigned to the correct accounts. for instructions on viewing/modifying fee items. You should click into each fee item to verify that the Income Account has been correctly assigned. If charging sales tax, verify that each tax item is assigned to a matching account. for instructions on verifying/modifying sales tax items. Click on each Sales Tax Item and verify that the Tax Account listed is correct. Create an individual invoice, a payment for that invoice, and a sales receipt in the Billing Module. See for instructions. You will delete these transactions after you are done testing. Note the Account IDs that are being referenced. These are the general journal entries that will be made in your accounting software. Choose the following fields: Date, Reference, Number of Distributions, G/L Account, Description, Amount. From the Options tab Browse to find the file that needs to be imported and place a check by First Row Contains Headings. View the imported Journal Entries by going to Reports & Forms, General Ledger, General Journal. You should be ready to export now on a regular basis. NOTE: Sage 50 exports will only work with Sage 50 products, and not with other Sage products such as Sage 100, Sage 300, etc. .
Click Journal Entry Export – Accrual Basis or Journal Entry Export-Cash Basis in the Executive section. Specify the desired date range in the Report From and Through fields. (Optional): Enable Show exported transactions if you wish to see previously exported transactions. (Optional): Enable Show Refunds. Refunds will not be included by default on the journal entry export for either cash or accrual basis but could be included by selecting the "Show Refunds" checkbox. Because the reversal is often handled in your accounting software through cutting a check or other manual reversal, the refund transaction is typically omitted from the export. Select Detail or Summary from the View drop-down list. If you wish to export the individual transactions for import into Sage 50, select Detail. Select Sage 50 (US edition) from the Format list. NOTE: The option to select a format is only displayed if you have selected Detail above. (Optional) Select an Item Type. This will allow you to filter the journal entries to a specific item type. (Optional) Select a Class. This will allow you to filter the journal entries to a class. Review the Journal Entry Detail Report for any errors. Fix as needed. All entries are selected by default for export, you may de-select any entries that you do not wish to export. Click the Export button. The Journal Entry Export file will be downloaded. Save the file and import to Sage 50 following Sage 50 instructions. Select Sage 50 (UK edition) from the Format list. NOTE: The option to select a format is only displayed if you have selected Detail above. 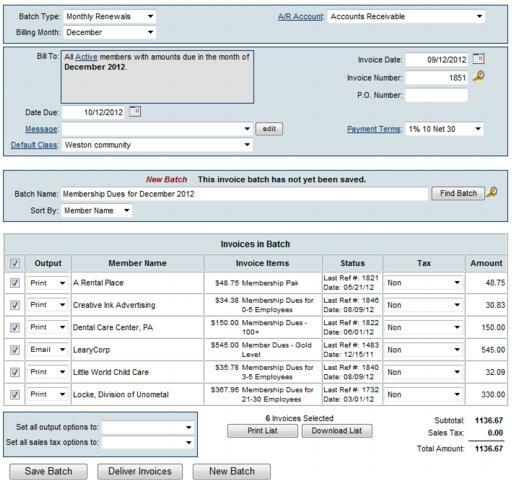 How to I create and send invoices for monthly membership dues? How do I create statements? How to I export my transactions to QuickBooks or Peachtree? How do I set up voluntary fees? What reports can I use to reconcile to my financial software? Which reports display cash vs. accrual based information? How do I track Trades? How do I make sure that the member name in CM/GZ matches what I have in Quickbooks? This page was last modified on 18 April 2019, at 11:58.